When configured to operate with remote temperature sensors, the Multi-SR is compatible with Sensors P1 through P9 shown in the SmartFan Catalog. Control temperature is a function of the temperature sensor selected and the position of the shunt (S3) on header J15. In this application, fan voltage is proportional to the temperature sensed by the sensor that is soldered to the Multi-SR. Header J17 is disabled. There are four jumper settings that must be reviewed prior to applying power to the Multi-SR: Output Voltage, Control Temperature, Alarm Speed and 3.3/5.0 On-Board I2C Power. Settings are based on application and the configuration of the Multi-SR. Following is a description of each jumper setting. 1) Control Temperature Setting (J15): The control temperature is the temperature at which the maximum voltage is applied to the fans. Header J15 allows selection from three different control temperatures. Table 4.0 shows the control temperature value for each jumper setting. If the jumper is removed, the default setting is MED. Chart 1.0 shows fan voltage vs. sensor temperature for each control temperature setting. NOTE: Header J15 is only applicable to Temperature Sensor based fan control. The setting of this header can be ignored in I2C based and PWM based fan control applications. The Multi-SR can provide power to either 48 VDC or 24 VDC fans from a 36 to 75 VDC input voltage source. Use header J1 to select the type of fan connected to the Multi-SR. Move the shunt to 24V if 24 VDC fans are being used. Move the shunt to 48V if 48 VDC fans are being used. CAUTION: If the shunt is removed, the Multi-SR will operate in the 24 VDC fan mode. It is not recommended that the shunt be removed for any reason. A mix of 48 VDC and 24 VDC fans cannot be connected to the Multi-SR.
WA = 3300 RPM x 2PPR x 0.3 = 1980 PPM. Since the 2000 PPM trigger is closest, set jumper J11 to the “MED” position. The alarm trigger accuracy is +/- 20%. If the shunt is removed from header J11, the Multi-SR defaults to the factory setting of 2000 PPM. 4) On-Board Isolated Power Setting (J18): The Multi-SR can provide isolated 3.3 or 5.0 VDC power for the I2C Bus and PWM/0-5 VDC input interfaces. Use header J18 to select the power required. Move the shunt to 3.3 if 3.3 VDC power is required. Move the shunt to 5.0 if 5.0 VDC power is required. If the jumper is removed from header J18, the Multi-SR defaults to 3.3 VDC power. NOTE: The position of the shunt on header J18 is not applicable when isolated power is sourced externally. Four alarm outputs, located at header J9, provide visual and audible status of fan, temperature sensors and microprocessor watchdog alarms. The failure criteria are defined in Table 5.0. Table 6.0 shows the status of each LED output on header J9 for failure and valid conditions based on using single color LEDs. If bi-color LEDs are used, the LEDs would switch color rather than turn ON/OFF. Major/Minor Alarm Logic (J12) Alarm logic for the optically isolated major and minor alarms on header J12 is shown in Table 7.0. The values in the table are based on the circuit configurations shown in Figure 3.0 (found on the Installation page). One or more sensors read a high temperature or are open and one fan has failed. A watchdog failure has occurred. Two or more fans have failed. During the presence of any alarm condition, the maximum fan voltage is applied to the fans. The I2C Bus is configured as a slave device that can transmit and receive data. When the Multi-SR is configured for I2C based speed control, the user can write speed commands to the Multi-SR and read all alarm status bits except the high temperature status bits. When configured for temperature sensor based control the user can read all alarm status bits from the Multi-SR. When configured for PWM based speed control, the user can read all alarm status bits but the high temperature status bits. The address for the fan controller is 0x0C (‘0001100’). The fan controller will stretch the clock further if needed. The hardware register will support Standard Mode I2C, however, the system is tested at 55kHz clock speed and lower clock speeds are recommended. Speed commands (when used) must be updated every 60 seconds or the fan voltage is sent to 100%. Table 8.0 defines the bits used in the serial bus protocol. Table 9.0 provides the definition of each of the sixteen status bits in the I2C protocol. The first byte, bits D7 – D0, provides the status of all fans and minor alarm status. The second byte, bits D15 – D8, provides temperature sensor and major alarm status. Read First Alarm Status Byte: The following format is used to read the first status byte (D7 – D0). Reading the first status byte can be performed under all configurations of the Multi-SR because it provides fan failure status, a feature common to all configurations. Example: S 0 0 0 1 1 0 0 1 ACK 0 1 0 0 0 0 1 0 ACK P…Shows that the fan connected to J4 has failed and the minor alarm status is active. Read First and Second Alarm Status Bytes: The following format is used to read the first and second status bytes (D7 – D0 & D15 – D8) of alarm status. 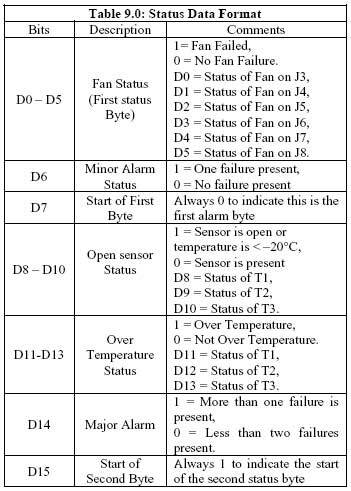 If Configured for Temperature Sensor Based Fan Control, the second byte of status information provides major and minor alarm status, open sensor and over temperature sensor information. Example: S 0 0 0 1 1 0 0 1 ACK 0 1 0 0 0 0 0 0 ACK 1 0 1 1 0 0 0 0 ACK P…Shows no fan alarms, sensors T3 and T2 are reading a high temperature and as a result the minor alarm is active. If Configured for PWM or I2C Bus Based Fan Control, the second byte of status information provides major and minor alarm status and ONLY open sensor status (D10 – D8). Since no sensors should be connected to the Multi-SR (header J17) under this configuration, only the presence of a sensor is monitored as a safeguard. Therefore, each over temperature status bit (D13 – D11) is always 0. But, if a sensor (reading > – 20°C) is connected to header J17, the corresponding open sensor status bit will be 0 and minor alarm status bits will read 1. Example: S 0 0 0 1 1 0 0 1 ACK 0 1 0 0 0 1 0 1 ACK 1 1 0 0 0 1 1 1 ACK P…Shows thermistors T3, T2 and T1 are open and fans on headers J3 and J5 have failed causing a major and minor alarm to be active. The watchdog/microcontroller alarm is not communicated on the I2C Bus. A watchdog failure is a major alarm condition. Therefore, remote detection of a watchdog alarm is available via the major alarm logic circuit output located on header J12. Table 10.0 shows the data format for writing a speed command to the Multi-SR I2C Bus. 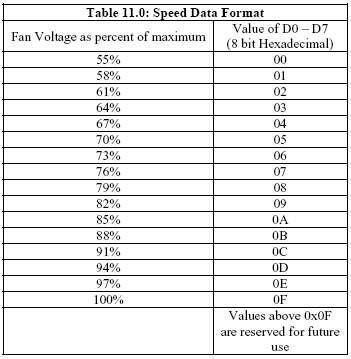 Use the hexadecimal values listed in Table 11.0 to control fan voltage via the I2C Bus. Writing a hexadecimal number to bits D0 – D7 changes fan voltage. The following format is used to write a speed command to the Multi-SR. Because of the way the I2C Bus is implemented, a speed command is acknowledged by the Multi-SR under all configurations but is ONLY executed when the Multi-SR is configured for I2C Bus fan control. Speed commands must be updated every 60 seconds or the fan voltage is sent to 100%. Example: S 0 0 0 1 1 0 0 0 ACK 0 0 0 0 1 0 1 0 ACK P…Shows a write command that sends the Multi-SR to 85% speed. Use the links below for addtional manual pages or for a complete manual click on the Operation/Installation Manual PDF link above.